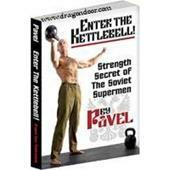 When Dragon Door launched Paul Wade’s Convict Conditioning in December 2009, it took the fitness world by storm—and rapidly became not only a #1 bestseller, but Dragon Door’s most popular title ever. To date, over 400 customer reviews—on Dragon Door’s site alone—have testified to the enduring results and powerful physical transformations that have become the norm for Convict Conditioning converts. 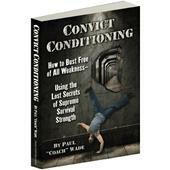 Paul Wade’s remarkable Convict Conditioning 2, featuring bodyweight maestro Al Kavadlo and his brother Danny, cemented Paul Wade’s reputation as the finest bodyweight strength author on the planet. And then to cap it all, came the "Alcatraz" Convict Conditioning video series, which have been hailed as the most superb exercise video documents ever filmed. Period! Now, Dragon Door and Paul Wade present an opportunity for trainers and bodyweight exercise enthusiasts worldwide to plunge deep into the Convict Conditioning oeuvre, with the Progressive Calisthenics Certification Workshop—to both master the progressions personally and be qualified to teach them to others. If there is a white-hot trend in fitness right now, it’s bodyweight strength training. Athletes of all kinds are looking to the toughest, most brutally productive calisthenics techniques to spice up their workouts. 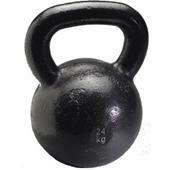 We’re talking one-arm push-ups, pistols, pull-ups, handstands and hanging levers! Sadly there has been no international industry standard for bodyweight strength training instruction. 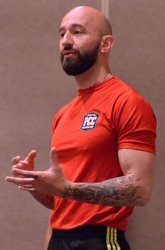 Dragon Door introduces bodyweight strength authority, Al Kavadlo (CSCS, PCC Master Instructor), with Danny Kavadlo (PCC Master Instructor) to lead the Progressive Calisthenics Certification. What does the PCC have to offer you…? The knowledge gained from the Progressive Calisthenics Certification will take your physical development to the next level…and beyond! Bodyweight strength training was loved by old-time strength athletes for a reason. It generates massive power, coordination and balance, protects the joints, revolutionizes the physique, builds tendon integrity and blow-torches fat from the body. Bodyweight strength really separates true athletes from the poseurs—millions of gym-rats can do a bench press or a curl, but when somebody busts out a one-arm pull-up or a human flag, you know they are really something else! A PCC course certification will add massive value to coaches and personal trainers. Not only are the movements extraordinarily cool—and adjustable to any skill level—they are also amongst the most effective, functional techniques on earth. Plus, they require NO expensive equipment. The PCC workshop is unique. Nowhere else has such a comprehensive selection of powerful bodyweight techniques been brought together and taught in a progressive environment. The PCC represents the ultimate bodyweight cert, and whatever your field or specialization—from strength training to rehab, bodybuilding to team sports—you will come away from this two-day cert with vast resources of training knowledge unavailable anywhere else. If just one movement could be said to exemplify bodyweight strength to the world at large, that honor must go to the pushup. Not every elite athlete has picked up a kettlebell; not every sporting champion has used the bench press; but every able-bodied man and woman, at some stage, has attempted a pushup. There’s a great reason why pushups have remained so popular: they work. Big time. The raw, unabashed effectiveness of the pushup in building strength and conditioning is unquestionable. Boxers, combat athletes and military personnel have long loved this movement. Footballers and team athletes likewise. Whether you want to excel in these areas, coach others in this movement, or whether you just want to ascend to "black belt" push-up status, the PCC cert will give you all the tools you need to get to the next level. 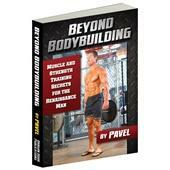 In this in-depth module, Al Kavadlo and his Instructors will share the hard-fought secrets and training tactics that will let you dominate this essential movement pattern—from beginner’s exercises, all the way to the coveted one-arm pushup. •	How to fine-tune possibly the best transitional exercise there is—the archer pullup—to propel you on your way towards the legendary one-arm pull-up! Many coaches and athletes know how to strengthen their front and back muscles with calisthenics: but what about the sides of the body? Throughout history the great strongmen—dating back to the Greeks and Romans—have known that the sides of the body are the key to strength and power. 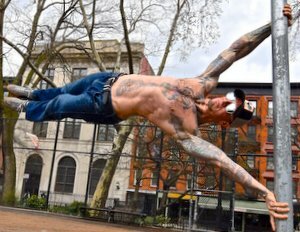 When it comes to bodyweight strength for the lateral aspects of the anatomy, there has only ever been one serious "Gold Standard"—the human flag. Many athletes have tried this hold, and almost all have failed, because they didn’t understand the progressive steps which can be used to unlock the flag. Al Kavadlo was the first coach to ever bring progressive human flag training into print—via his creative contributions to Convict Conditioning 2. In this unique module, athletes will be taught his special techniques and tricks. Here you will begin by learning the fundamentals of the clutch flag, the easiest variation of the human flag. From there, Al will lead you by the hand, demonstrating all the progressions and approaches necessary to build up to one of the most incredible bodyweight strength feats there is—the press flag. If you want to master this amazing one-in-a-million strength feat, you cannot afford to miss this! If there is a calisthenics movement which separates serious athletes from the "all-show-no-go" crowd, it is the muscle-up. Part explosive pullup, part brutal bar dip, the muscle-up tests explosive power, coordination and upper-body strength like no other exercise on earth. This module is aimed at bar athletes of all abilities. If you bust out your first-ever muscle-up during this workshop—fantastic! If not, don’t panic: you will take home all the knowledge you (or your clients) will ever need in order to totally dominate this legendary bar movement. Expert bar athletes already comfortable with the muscle-up will be taught new and advanced muscle-up variations by a world-renowned master of the art. Many strength athletes possess strength and muscle in spades…but how many have the breathtaking poise and body control to pop up into a perfectly balanced handstand? 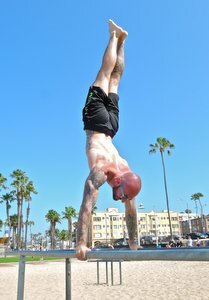 In this module you will learn how to painlessly teach your body the inverse position using traditional headstands; you will become expert in the most efficient method of kicking up into wall handstands (a rarer ability than you think); and you will be taught all the professional drills and skills needed to build your perfect free-balancing handstand from the ground up. Has the perfect handstand always been just beyond your grasp? 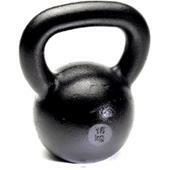 Equilibrium, power and shoulder strength can be yours! "If I had to name the most important strength-building exercise in the world, it would be the bridge. Nothing else even comes close." This is a huge claim, but those coaches and athletes who have taken Paul at his word have never looked back! Bridging safely strengthens the spine, reinforces deep tissues, increases total-body flexibility and effectively bulletproofs the body from injury. Bridging genuinely is one of the greatest techniques in the calisthenics armory. It’s a sad irony that very few coaches—even experienced pros—know how to build bridging power safely and correctly! Those of you who really want to maximize their results from this unbelievably beneficial exercise will leave this module feeling like lottery winners. During the bridge module, athletes will be shown how to build to an expert bridge using the (hugely underused) corrective exercise, the straight bridge. From there, you will be taught how to perfect the elements of the classic bridge; how to practice old school wall walking safely and productively; plus how to approach advanced bridging techniques like the stand-to-stand bridge, and bridge transitions into handstands. There is a long-held myth that bodyweight training systems neglect the legs. In fact, nothing could be further from the truth. Never forget that the two most important lower-body movement patters in all of athletics—running and jumping—are bodyweight movements. Often in sports or competition, the legs push off the ground one at a time; in leaping, sprinting, kicking. For this reason, all athletes who wish to excel at these movements should apply a calisthenics regimen that includes bodyweight squatting, building to full squatting on one leg. Even those who wish to squat with massive poundages on a bar should begin by perfecting their bodyweight squatting form; because adding heavy weight to weak movement patterns is like building a house on faulty foundations…something’s gonna give, eventually. This module—part training session, part diagnostic clinic—addresses all these issues, beginning with pre-squatting exercise, and building up to transitional exercises like shrimp squats. Useful techniques and smart strategies for building up to an ideal one-leg "pistol" are included. There are bodyweight abdominal exercises—and then there are real bodyweight abdominal exercises. Almost everyone who visits a personal trainer is taught how to perform crunches, but these are the weakest and least effective of all abdominal strength techniques. Comparing crunches to strict hanging leg raises and L-sits is almost unfair…it’s like comparing a pea-shooter to artillery cannons! In this module we will drop to the floor to explore exercises like the tuck hold and the N-hold, preparatory steps to achieving the classic L-sit. From there the torture gets worse, as students return to the bar for a painstaking examination of hanging knee raises and straight leg raises. In this session, athletes will learn how to master the frog stand—beloved of yoga masters and gymnasts alike, this ancient and simple floor exercise strengthens the hands, wrists and body, improves balance, and provides the key to unlocking advanced headstand transitions. Students will also be taught the lesser-known advanced variations of the frog stand which are essential for mastery of seemingly superhuman total-body exercises like the planche. Moving on from the frog stands, athletes will be given the opportunity to work on the classic floor-based strength hold—the elbow lever! This part of the session will include progressions, tips and tactics for generating a rock solid elbow lever that can be preformed anywhere, anytime—effortlessly. The front lever is arguably the ultimate total-body strength-tension exercise. It requires HUGE power in every muscle from the legs to the fingers. This is why it’s such a shame that you will probably never see this exercise performed in a commercial gymnasium. Many athletes either don’t know about front levers, are unable to perform them, or simply don’t know how to go about training for them. If you want to perfect your front levers, or if you want to learn superior progressions to move up to a front lever—or if you’ve never even seen front levers before—then this module will hit the bulls-eye for you. Beginning with safe but powerful floor exercises like dragon holds, leading through to hanging tuck exercises and leg extension methods, Al will lead you by the hand and show you just what you need to do to catapult your bar strength skills into the big leagues. 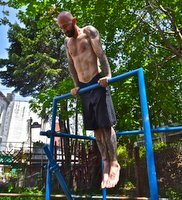 In calisthenics, there are three advanced total-body static techniques which, when used in unison, strengthen the entire body from virtually every angle, producing unbelievable strength and durability. The first is the human flag, which builds every single muscle in the sides of the body. The second is the front lever, which predominately works the front of the body. The third part of this sacred trinity is the subject of this final module: the back lever. but performing a back lever feels pretty close!" No serious bodyweight athlete should neglect this exercise, and this session will cover the step-by-step methods required to achieve a perfect rear lever safely, whether you want to teach the hold, or simply benefit from the functional benefits it has to offer. If an athlete understands the science behind progressive calisthenics, any bodyweight exercise can be broken down into a family of movements that go from "piece of cake" to "superhuman". 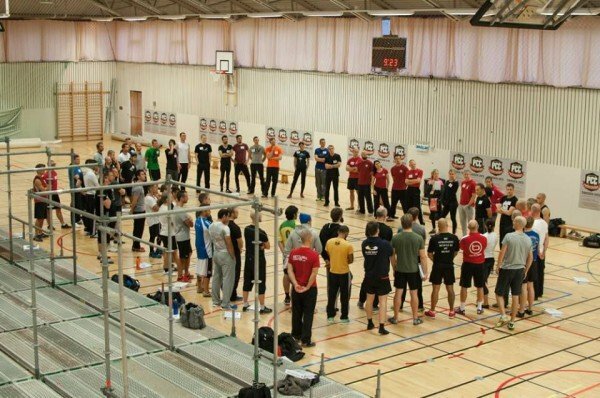 Simply mastering techniques is not enough to rise to PCC status; you must also have an understanding of how to integrate all this knowledge in the context of programming. This is the broad subject of this straight-to-the point seminar. The seminars will also function as a further chance to pick the brains of Al Kavadlo (CSCS, PCC Lead Instructor) and Danny Kavadlo (PCC Instructor). In addition to this comprehensive certification, attendees will receive a copy of the 600+ page super-textbook, The PCC Instructor’s Manual, featuring the contents of the course, and nearly a hundred exercises. 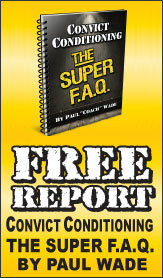 This book will only be available to athletes who attend PCC, so don’t miss out. Places for this certification will fill up incredibly fast—don’t delay! If the grueling two-day download of skills and knowledge wasn’t enough, to certify attendees must emerge victorious from a brutal demonstration of bodyweight ability: The Century, so-called because it demands a hundred repetitions of painful perfection! *** Those wounded warriors who fail to complete this draining gauntlet on the day—and there may be many—will be given the opportunity to apply what they have learned and re-take the test via video within sixty (60) days.